When we decided that Hanna was going to public high school this year, I was excited about the prospect of having no one home but my little nephew that I watch. Caleb went through some bullying issues that left a deep impact on him last Spring. We were thankful that his teacher took care of them quickly once he finally told us what was going on, but the damage was done. He’s also been having some pretty serious stomach issues and he’s been sick constantly ever since we moved back to California and he started at this school. 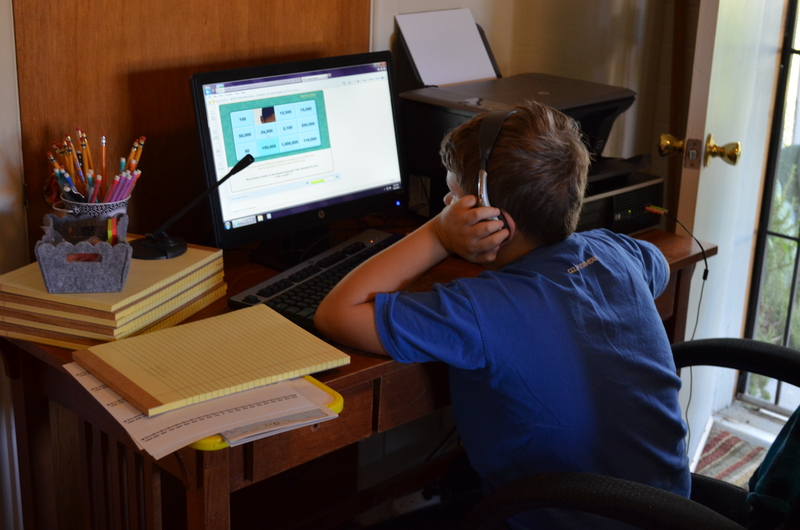 Three weeks ago, Tom and I started looking seriously into what virtual school would mean for him. I knew I didn’t want to be responsible for homeschooling again, and we knew his temperment well enough to know that forcing him to school was going to be disastrous. We said a prayer and jumped into K12. I don’t like making these big decisions so quickly, but we had just about a week before school started in our community. It hasn’t been the easiest to get set up – somehow, he missed getting assigned a teacher, his books didn’t show up until a day later than he needed them, and on his first official day, the entire system went down. So far, it’s going well. He has a little more freedom if his health needs it, and I’m pretty sure this curriculum is more rigorous and has more depth than what his fifth grade classroom would have been. In addition to the core curiculum, he also has art and music appreciation classes and can be active in community sports programs. I love that he’s essentially being homeschooled, but I don’t have to do all of the work. Of course, I help when needed and Tom and I are both able to check on things either with him or through the computer. I don’t know, at this point, whether we’ll continue this all year or just until some of his health issues are settled. He is very much a home-body and an introvert (like me) and when we made the decision to homeschool Hanna again for a season last year, he begged to come home as well. It might just be the best option for him, at least for the next few years. I’m reminded again that I am so grateful we have these options to find the best option for our children. We have a part online piece with our older 2 and I like it alot.